Successfully Added Bluetooth Rearview Mirror with Built-in GPS Navigation (4.3 Inch Touchscreen) to your Shopping Cart. Replace your normal rearview mirror with this all-in-one Bluetooth Rearview Mirror for hands-free cell phone calling, built-in GPS navigation, and beautiful multimedia on-the-go! 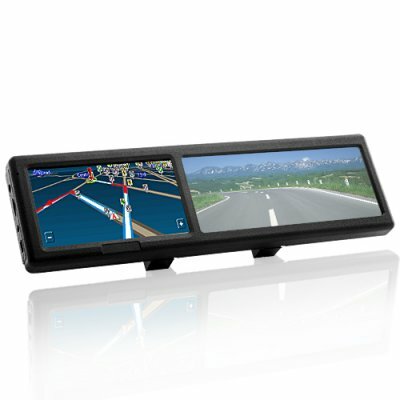 Also featuring a 4.3 inch touchscreen, this high-tech rearview monitor is one of the safest and smartest car gadgets available. The power of Bluetooth: Phone calls are made safe and easy with this Bluetooth Rearview Mirror. Just connect your Bluetooth-enabled cell phone to the device and you can talk directly to others with the mic and listen through the speakers. Finally, a way to keep your eye on the road without having to cut off cell phone communications! Powerful and fast GPS: Say hello to accurate and reliable GPS navigation with this Bluetooth Rearview Mirror's advanced SiRF STAR III chip. Along with a Media Tek MT3351 468 MHz processor, you have fast and up-to-date directions available at your fingertips. Safe and conveniently placed: Designed with your safety in mind, this Rearview Mirror makes everything available directly in front of you, which means you can keep your eye on the road while tracking your destination. Entertainment while you wait: Stuck in traffic, waiting to pick up your kid from school, or just plain bored in the car? Well this handy Rearview Mirror has something for everyone and includes high resolution video playback, speakers for music playback, and plenty of entertaining touchscreen games! Best of all, with FM transmission, whatever plays on the GPS can broadcast through your car speakers for maximum sound effects. Free 4GB micro SD card included for storing maps, pictures, videos, etc. Does this unit come supplied with a micro SD card? Yes! It comes with a free 4GB micro SD card that comes with evaluation GPS software. You don't have to pay to use GPS. The satellites which transmit GPS coordinates are maintained by the US government. You just need a GPS receiver to take advantage of the data.